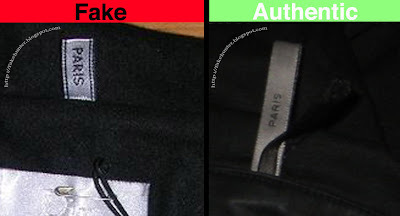 If an item has an authentic tag attached, it DOES NOT guarantee authenticity. Tags can be switched so check the rest of the pictures, the description, and the seller's feedback and items sold. 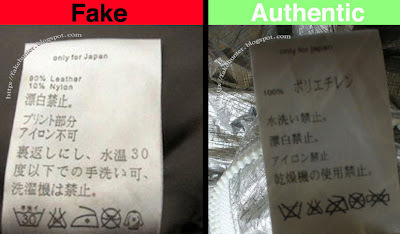 However, a fake tag does pretty much guarantee that the item is fake. 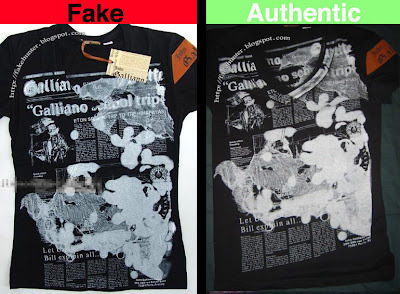 There are loads of Dsquared fakes on eBay, and, with some of them it can be hard to tell the difference. So, a good place to start is with the hang tags (if attached). The same tag is attached to all Dsquared items and it does not vary in size. If the seller has no close-up shots of the hang tag (or if there's another detail you would like to see) ask for them. If the seller won't supply them, or is just being a jerk, go bid on another seller's item (like mine!!). The tag is thick cardboard with a black matte finish on the front. Near the bottom is the Dsquared2 logo. The letters should be glossy and slightly raised. Above, in the example of the fake you can see that the letters are not raised because the light catches all the letters uniformly with no highlights or shadows. Below is a close-up example. In the close-up you can also notice that the "2" is in a different type face. 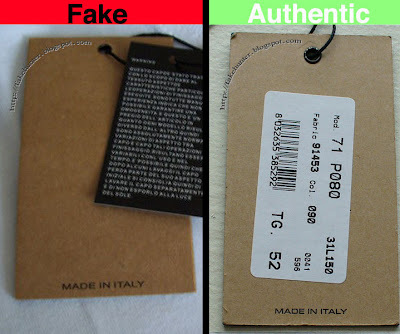 This is good to keep in mind because a lot of the fakes have this 'incorrect' "2," not only on the hang tags, but also on the sewn labels and elsewhere. The back of the tags should be the raw cardboard color. The only real difference here is that the fake "Made in Italy" text is slightly larger and positioned lower than the original. All of the men's John Galliano shirts have lace sewn inside the collar (it varies in color from white, black, orange, etc.). 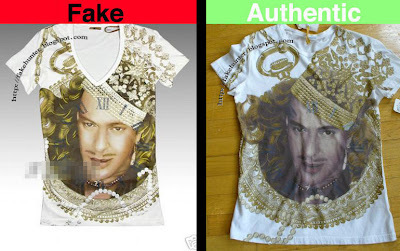 Most of the fake shirts also have lace sewn in the collars, but the counterfeiters have not reproduced the exact same lace pattern. 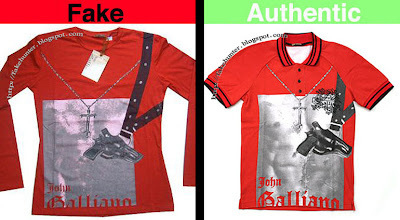 The rubber "John Galliano" logo tags also vary slightly from the authentic ones, in size and proportion. The lace on the fake shirt above is a simpler design and shaped in a more circular pattern, whereas the authentic lace is more intricate, and shaped in an elongated oval pattern. 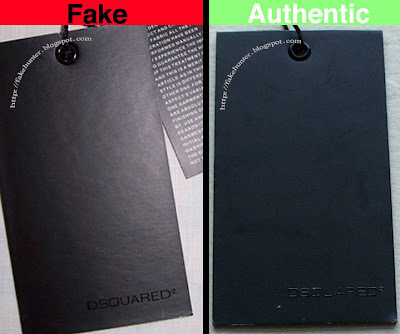 The fake rubber logo tag is not quite as long as the authentic tag. If you look closely you may also note that the fake letters are vertically elongated slightly more than the authentic letters. 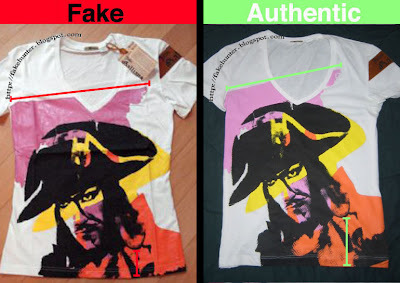 This elongation holds true for most of the fake Galliano logos out there (be they on shoes, pants, t-shirt armbands, etc.). It is a subtle difference, but if you compare two pictures side by side you can see it. This is another comparison photo of the lace. This fake lace is in a different pattern than the first example, but, you guessed it.... still fake. This fake rubber logo tag shares the same disproportions as the first example. Below are some more examples. 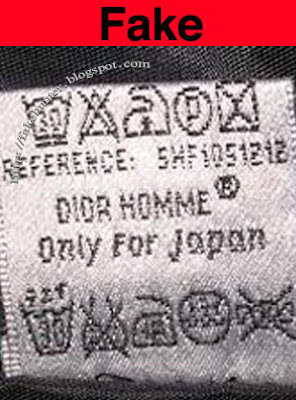 Most Dior Homme sneakers have an embossed "CD" (christian dior) logo on the back of the shoe. This, again, concerns quality. The logo should be deeply embossed with clean smooth edges. I created the discussion forum to act as a supplementary resource for this blog. It is a place to share information and ask questions. 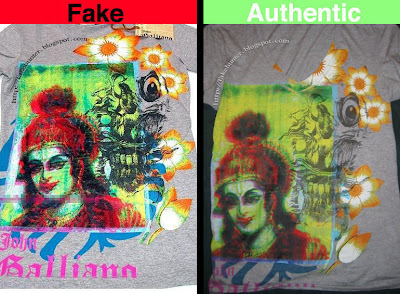 It will also serve as a place to post warnings about fakes being auctioned on eBay (or other online auction sites), and to discuss the blog or fashion in general (ie. new designers, places to shop, etc). I thought this deserved its own section. The real version of this jacket fetches between $3-6k on eBay. It is a beautiful piece of fashion history. Recently though, a fake popped up on eBay. 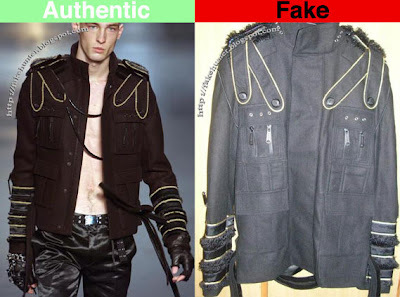 It was kind of tricky because the seller used several pictures of an authentic jacket and then a few pics of the fake jacket. The item got a lot of bids and was breaking the $5,000 mark when eBay finally removed it at the last minute. The seller relisted it and the same thing happened again. eBay was only able to catch it because many members reported it. Luckily some bidder saved some serious cash by not winning it. To try and stop that from happening again; here are some photos of the fake jacket. I've included the runway photo for comparison purposes. In the comparison above you can see that the gold trimmed epaulette straps are much more rounded at the ends than the original. On the real jacket they form more of a "V" shape, not a "U" shape. The strap length is also reversed on the fake, the longer one being the inside strap, not the outside strap like the original. Examine the zippers and the 'fur' trim on the cuff and the epaulettes. The original jacket has short cut horsehair trim as opposed to the knock-off's longer fabric trim. The zippers on the knock-off are the rounded tear-drop style with the semi-circle hole, that only came into production a couple seasons ago (and this Napoleon jacket is from 2001). The zippers on the original jacket are rectangular with string pulls and small leather "Dior Homme" logos on the pulls. Please be cautious when bidding on these jackets. 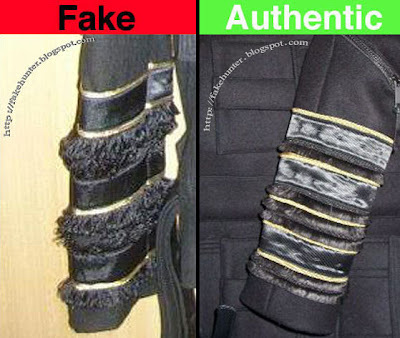 The fake auctions often include some shots of a real jacket and then one or two of the fake jacket. To be safe, ask the seller to take a shot of the front of the jacket with a piece of paper with the seller's eBay name written on it. This ensures that the jacket pictured is the actual jacket for sale. 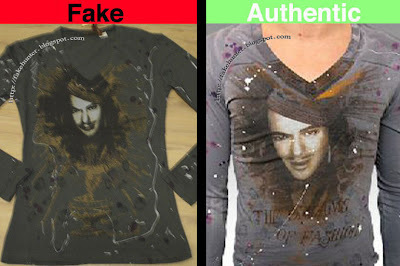 If you see a fake item on eBay please report it. There is a 'report this item' link at the bottom of each auction page. Helping some unaware bidder save his hard earned money, and cleaning up the fakes on eBay will be well worth the time. 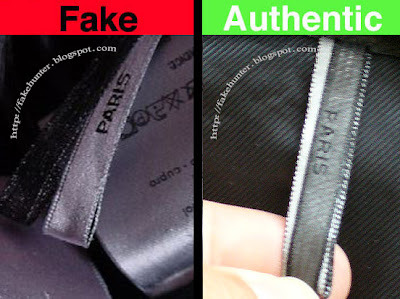 The "Paris" tag is sewn into the collar of coats and jackets and suits. It is a silver loop with "Paris" embroidered on both sides. There is a thin black mesh loop that covers the silver loop. The tag should be about 1.5 inches long (4cm). In the example of the fake tag above we have several things wrong (other than the creepy thumbnail). This fake tag is a stubby little thing. The letters are also further apart and larger in scale than the authentic tag. The other thing that is off is that they are 'upside-down.' 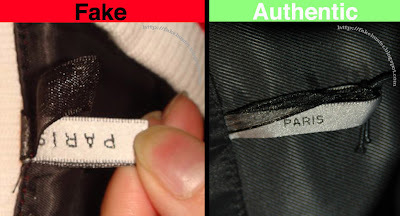 When the jacket is on a hanger and the tag is pointing down the "P" should be the closest to the collar seam. If you pull the tag up (so it is pointing towards the top of the hanger) and read the backside the "S" should be the closest to the collar seam. The fake tags often have this reversed, so it is a sure signal. 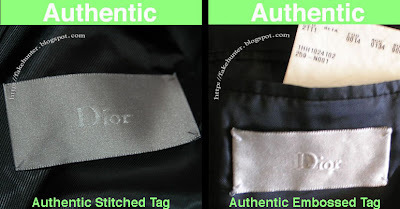 However, I have heard from several people who have bought Dior jackets (that they swear are authentic from authorized retailers), that occasionally an authentic jacket will have a reversed Paris label. If this is true it seems to be a rare occurrence. Keep this in mind and use your best judgment. This is where that little piece of knowledge comes in handy. The fake on the left is a pretty good copy. If you click the image and enlarge it you can see the letters are a little shaky, but all-in-all it's fairly convincing. However, the tag is reversed. The tag is pointing down and the "P" is not the closest to the collar seam. 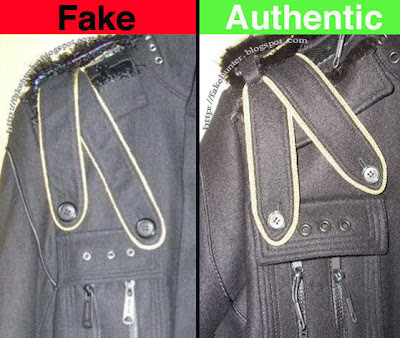 Granted there may be exceptions to this rule for authentic jackets, but it is a good red flag because so many fakes do have it reversed. Upon closer inspection of the fake above you can see that the letters are too close together, the tag is too wide, and the writing is not centered on the tag. This example above is of another fairly accurate fake, but again, the fake letters are reversed and they are a little bolder and also closer together than the authentic one. The authentic Paris tag has a little more spacing between the letters than this fake example, but not as much spacing as the fake example below. This is a decent fake. The letters are going the right way, though it's not a very clear picture. Even so, you can see that the letters are spaced too far apart. It should appear as "PARIS" not "P A R I S"
The fake above is kinda pathetic... I almost feel sorry for the little guy. However it does have one thing correct, the letters are going in the right direction. The tag is pointing up towards the collar and the "S" is the closest letter to the collar seam (if it were pointing down it should be reversed). This knock-off is also missing it's stylish mesh loop. 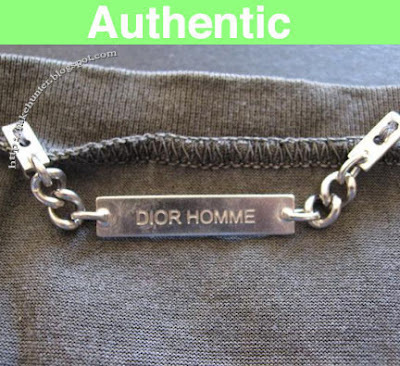 When shopping for Dior Homme online, the quality of the fabric, stitching, and construction are all very good indicators of authenticity. However, things can often look much better in the photos than in real life. A good back-up is to know a little about the tags and labels sewn inside the garment. 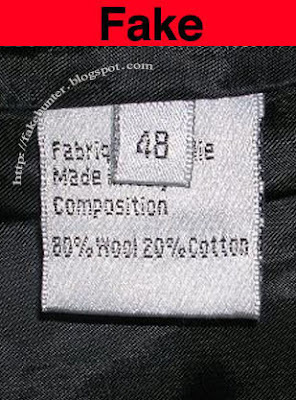 The fabric content tags can offer a good amount of information regarding the piece's authenticity. The fake tags above are good examples. The authentic tags are made of a very smooth silver material with almost no texture. 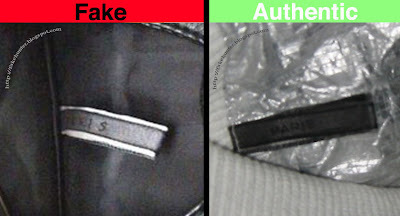 Many of the fake tags have a rougher surface (as seen above). The bad fakes also have frayed edges like the one above. Another key is to note the fabric content. 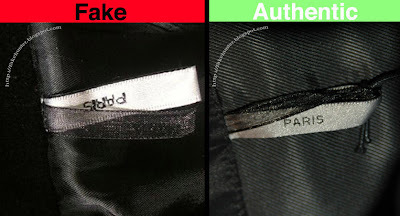 Sometimes the fake tags are mislabeled and give incorrect fabrics for the particular item. If you are looking at a wool over coat that is labeled as 100% polyester, you know something is wrong. Watch out for typos too. Occasionally a typo may occur on an authentic tag, but it won't be more than a slight misspelling. 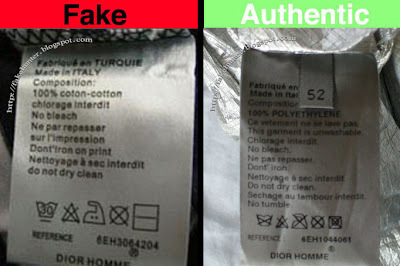 In the example of the fake above you'll notice that it says both "Fabrique en Turquie" (made in turkey) and "Made in Italy" below that. A substantial typo. 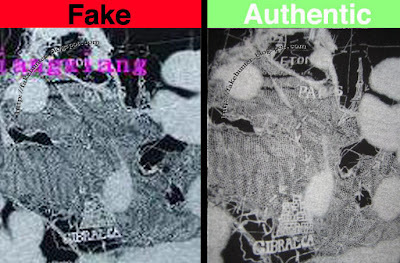 Here are two examples (one fake, one real) of a similar style tag. 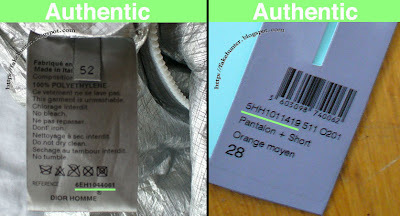 The authentic fabric content tags do vary based on the collection and the item. There are many different variations so the key here lies in the texture, edges, and typos. This tag also contains the reference number which gives information about the year and season. If you have some idea what season the item should be from, check it against the reference number to make sure they correspond. 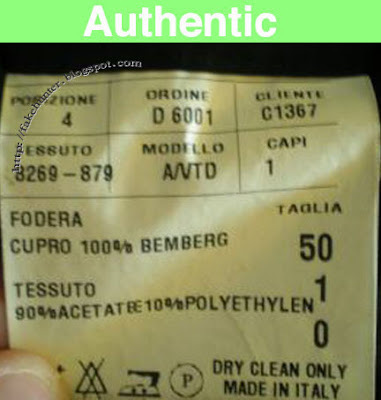 This is another variation of an authentic fabric content tag. This one is from a suit coat from an earlier collection (Luster, a/w03). For more information on reference numbers click the "reference number" tab in the Dior Homme drop-down menu to the right. Fake John Galliano shoes are starting to appear on eBay. Luckily, they are VERY easy to identify if you know what you're looking for. 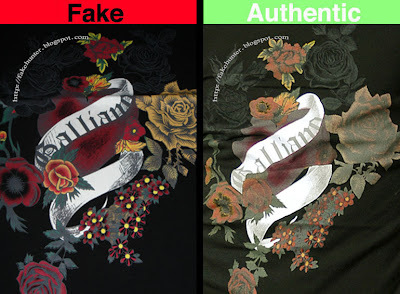 Above is a comparison photo of a fake v. real pair of Galliano sneakers. Set aside the color combos for these examples because these Galliano shoes were produced in a variety of different colors, including red and white. Also, please note that although the shoes in the authentic example are canvas there were patent leather and canvas versions produced. One of the major differences is the logo on the bottom of the sole. The fake logo is much smaller and it is slightly stubby, wider, and more cut off than the actual logo. 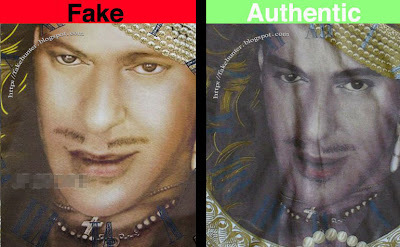 Inside the fake logo is very cheaply printed. You can also see how thin the 'leather' and padding are on the fake shoe. ...and the differences continue with the lacing structure. Notice anything different about these boxes? 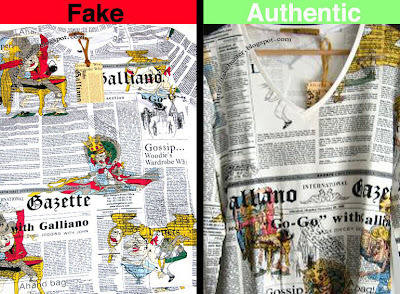 Yes, the authentic Galliano shoe boxes have the detailed Gazette newsprint all over them. The counterfeiters decided to save the printing costs and opt with the black on white style. All in all, the Galliano shoes that are spewing out of China are pretty bad copies. This is a case where it is really good to be familiar with the product you are buying. If you know what you're looking for you won't get tricked by highly inferior knock-offs.